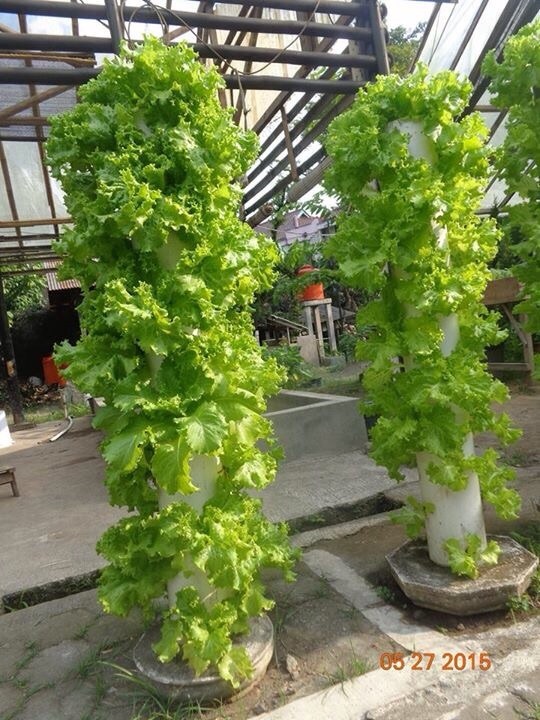 Verticulture is short for vertical agriculture, in which plants are planted vertically on manmade structures. The media for this technique are the same as that for conventional farming, however, it does not require as much area. For example, in conventional method, five plants can fit in one squared meter of a plot. Verticulture, on the other hand, can allow as many as 20 plants on the same area. Verticulture is container planting where the containers are arranged vertically. And thus this method optimizes the vertical space. This technique is very appropriate for urban gardening because of the scarcity of planting spaces in big cities. Easily made from available material. The containers can be made from disposable water bottles, gutters, PVC pipes, bamboo, wood, etc. Easily maintained. Stacked plants and smaller surface area make watering more efficient and less evaporation. Weed control is also easier. Easily moved. The container system allows easy movement of plants to the more appropriate location. Many plants are sensitive to humidity and require lots of sunlight. Because the Sun does not always stay in the same location, plants may flourish or suffer depending on the time of the year. To get the right amount of sunlight, the containers can be easily moved. Increasing aesthetics. Various plants can be grown on a verticulture system and thus add beauty on the garden. There is only one disadvantage of this method: it requires a higher initial cost to build the containers. A combination of organic and synthetic fertilizers is recommended for this method for optimal yields. Composts of plant or animal byproducts provide organic matter and micro nutrients, and also maintain medium porosity. While NPK and KCl provide the macro nutrient requirement. A well balance fertilizer application ensures healthy plant growths. The types of fertilizers should be adjusted to the kinds of plants, ie. leafy vegetables require different nutrient from fruiting plants. Verticulture requires simple growing medium, consisting of compost, rice husk charcoal, and soil with 1 : 1 : 1 ratio. The rice husk increases porosity to allow water to reach the lower plants. Annual vegetables are the best plants for this system. These include, but are not limited to celery, a family of chinese cabbage (caisim, pak-choy, bok-choy), green and red leaf lettuces, sawi (mustard green), tomato, cabe (chilli pepper), terong (eggplant), etc. For mix planting, the top planting spots should be reserved for plants that require lots of sunlight, such as cabe, tomato, terong and sawi. Whereas seledri, lettuce, and caisim can occupy the lower planters.